Some analysts remain doubtful that the fiscal impasse in Washington is having a material impact on the US consumers (as discussed here). 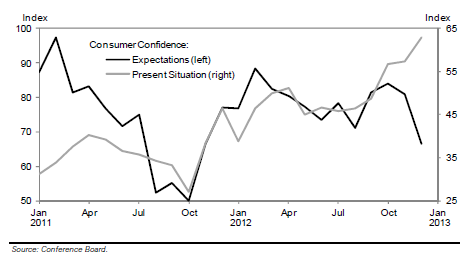 But once again we see the uncertainty showing up in consumer survey numbers. 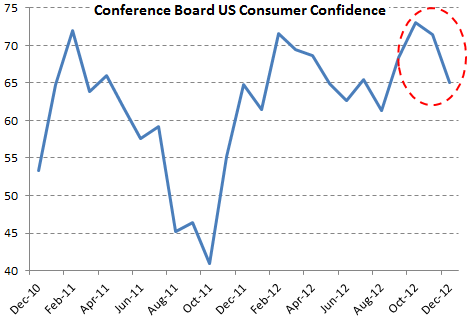 Last week's Conference Board confidence index exhibited a considerable decline. The same analysts argue that this decline is small in comparison to the Eurozone crisis-induced drop in confidence a year ago (discussed here). But one should consider two factors that make the latest confidence numbers a cause for concern. 2. The most compelling evidence is the divergence between consumer "expectations" and "present situation" (as the chart from Goldman shows). Consumers view the current conditions as the best since the start of the recovery, yet are extremely uneasy about the future. Econoday: - The consumer confidence report shows hard evidence that the fiscal cliff is hurting the consumer's assessment of economic conditions. The index fell 6.4 points this month to 65.1 with weakness centered in the post-cliff outlook, that is the expectations component which plunged nearly 15 points to 66.5. The assessment of the present situation actually is up, rising nearly 5-1/2 points to 62.8 which is by far the best reading of the recovery!